Year 3: Harnessing Growth & Opening Location 2. 5 Month checkup! Reflections on the first 150 days. Tell me about this New York Pizza… in Estes Park, Colorado. New York Pizza in Estes Park, Colorado: 2 Locations! Hell’s Kitchen – The Pizza! The Mega Don! A 26″ pizza that weighs in @ 5-6 lbs! 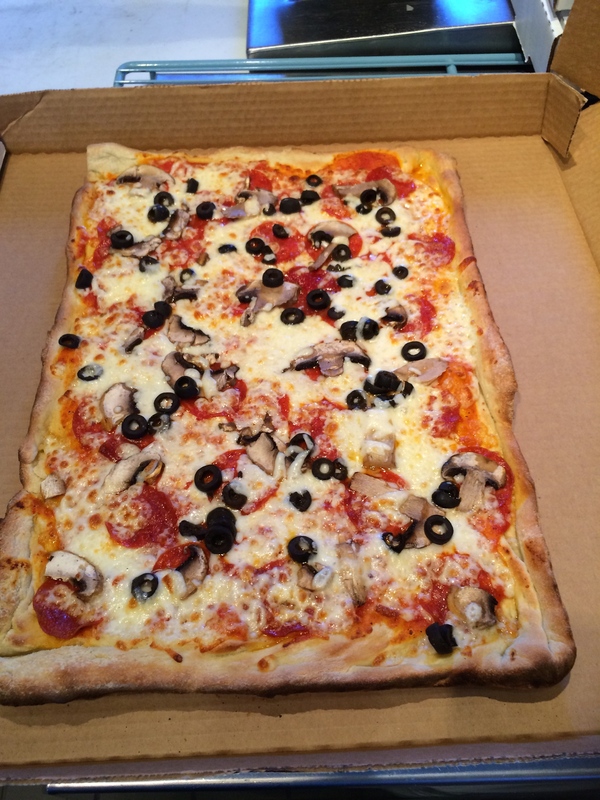 Our house specialty is a Sicilian Pizza. Why? Because we grew up eating them every Friday, then became obsessed with making them. There is something about the thicker crust and extra ladle of sauce that gives it a substantial taste. Sicilian pizza takes an extra few minutes to prepare due to additional steps. It is first proofed(allowed to rise) while in a sheet pan. It’s then baked with or without sauce for a couple of minutes(depending on who you ask), then fully dressed and baked like a traditional pie. 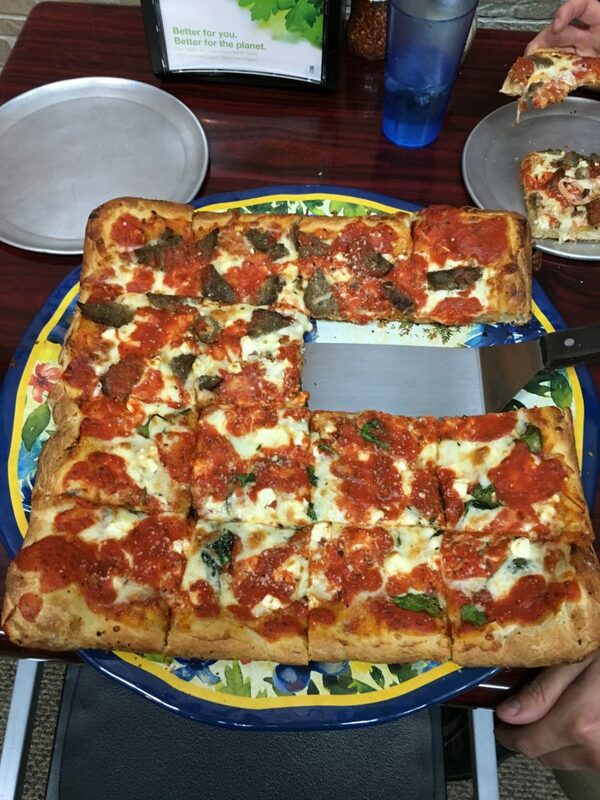 The weight of a Sicilian is heavier than our large pie so that we can create the thicker crust associated with Sicilian pizza. Traditionally, a Sicilian pie did not even have Mozzarella, it was topped with Romano and a few herbs. 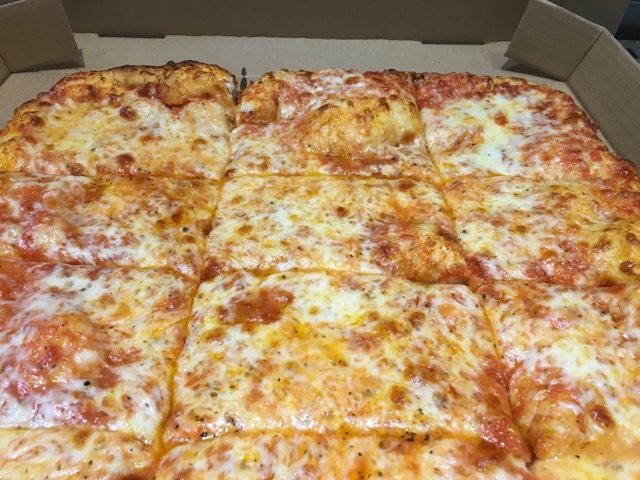 In the area of Long Island we came from which bordered Queeens, this style of pizza was called a “Grandma Pie”. If you ever happen to be in Elmont, NY, stop at Gino’s and order a Grandma pie. The Sicilian became a pie that was topped with mozzarella and the Grandma had more garlic and just Romano cheese on top plus the dough was brushed in olive oil so the taste is distinctly different. It comes in many variations today with some places using a square pan. We originally used a rectangular pan and have moved onto a 17″ x 17″ square pan for the large and a 12″ x 12″ for our small. It is absolutely delicious. In my opinion, the 15 minutes it takes to bake a Sicilian gives the ingredients far more time to cook together creating a superior taste. 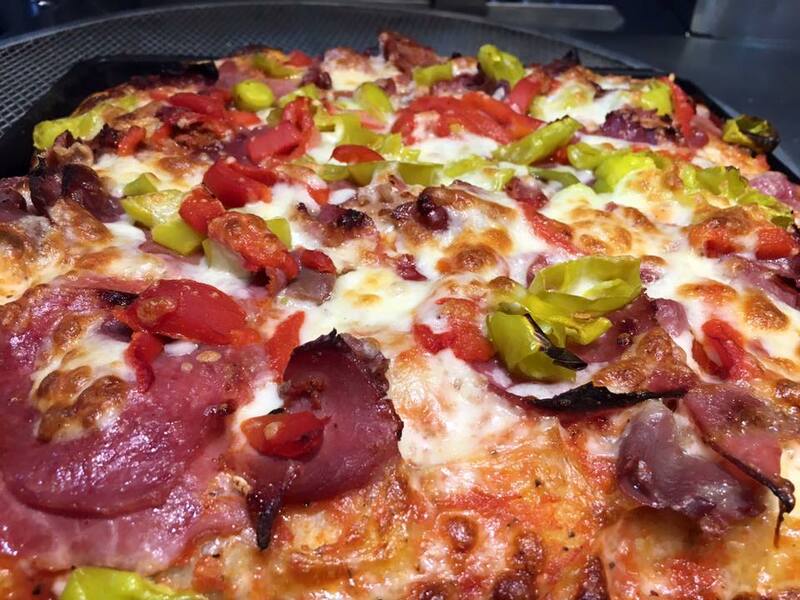 Order online or in-person only.